Well, OK, grapplers. I'm writing this in an emotional state after reading Cage Potato's "Please, God, No: Royce Gracie Wants to Fight Again at 'UFC Rio'" post just now. I may regret what I say later. It would not be the first time. "I'm still thinking (on fighting in Rio). But I'm always training. This return of UFC to Brazil touched me, made me feel the wish of coming back to the Octagon. Everything has being negotiated with Dana White. Let's wait and see." We can all agree that Royce is well past his prime and, more importantly, that the MMA fight game has evolved beyond his old school "circa the early days" capabilities. 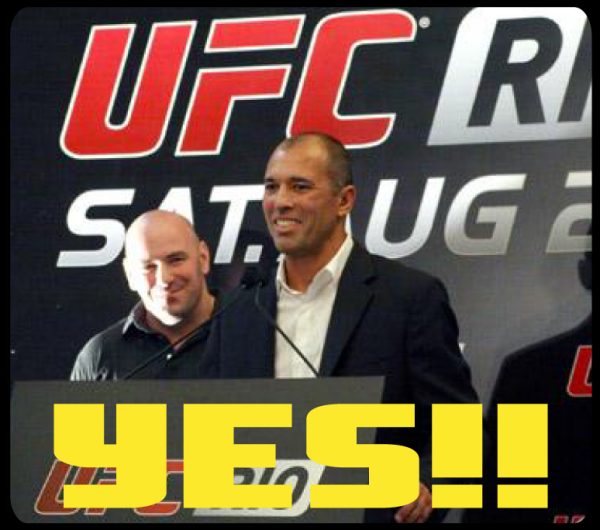 And, at the same time, he's the legend Royce Gracie. So, we're just going to throw all rational thought out window and say - let the man fight if that's what he wants! Like Royce said in promoting his bout with Matt Hughes: "This is my house ... I build it." Forget that he got crushed in that fight and just go with it. Go with it. You probably can't understand a word, but it's still very cool. I can't think of any fight between him and a current welter or middleweight that makes ANY sense. YES!! I just didi a seminar with Royce and he is STILL a badass.